Yesterday marked the 27th anniversary of the passing of Coach Bryant. 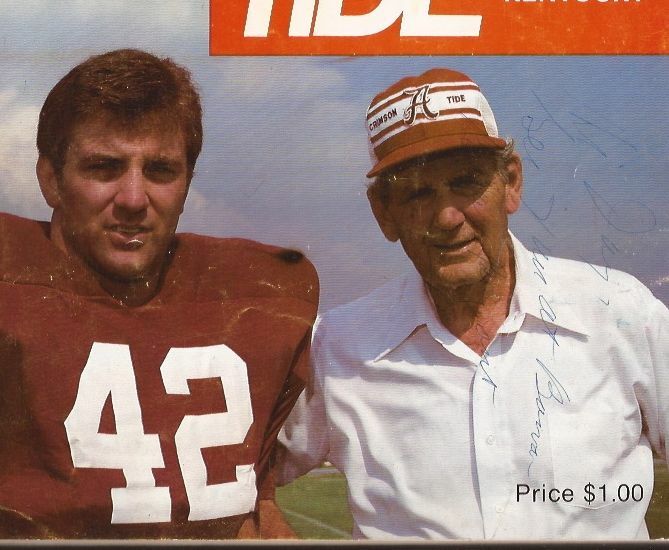 I had the privilege of being with Coach Bryant his last season at Alabama as a walk-on Qb. I have more special memories than I could ever recount. Growing up in Alabama, we all have vivid memories of that deep husky voice and stories of legend. I first got to meet Coach Bryant in Tuscaloosa on a trip with Jack Rutledge, father of Jeff. Mr Rutledge was my Sunday School teacher and we were thrilled to bump into Coach Bryant. I later met Coach Bryant when he introduced an evangelist at Ruhama Baptist church in East Lake, AL. I think I must have been around 15 years old at the time. It was the largest crowd that the church had in a long time and it made a few of the deacons mad. My grandmother pushed us through the crowd and told Coach Bryant, "My grandson wants to play for you one day." He smiled and said "Smart boy". The funniest part of that story is that she had a game program that belonged to my uncle Jerry. He had sent it with her to get an autograph. Later that afternoon, she gave the program to Uncle Jerry with Coach Bryant's signature: "Hi Jay, See you at Bama, Bear Bryant". My uncle wasn't too thrilled that my name was the one on his program. I later got to meet Coach Bryant in Tuscaloosa on a trip with Jack Rutledge, father of Jeff. Mr Rutledge was my Sunday School teacher and we were thrilled to bump into Coach Bryant. Coach Ken Donahue called me in January of 1982 and invited me to walk-on that coming fall. That was all I needed, I was going to play for the Bear. Coach Bryant walked up to our table at Bryant Hall on the first day of practice. He put his hand on my shoulder and said something.... no idea what he said. The team meetings were always interesting. Coach Bryant would tell stories, read Dear Abby, talk about football- I wished I had recorded every one. When he walked into the team room, everyone sat up straight and put both feet on the floor. I used to be amazed because he seemed so hard to listen to on TV with that raspy, deep growl, but in the meetings he was animated and you understood every word. He always preached kicking game first, defense second, and offense last. He always told us how we were going to win and we believed him. He loved playing and winning with class. This blog is getting way too long- but I have funny stories about JV football that season. We were bad and I was the Qb and I was bad too. We lost to Marion Military Institute, came from behind to beat Ft Benning, was destroyed by Livingston (who played their starting TB Johnny Shepherd against us- and I had to get stitches in my arm) but then beat Marion at home in a re-match game because we actually dressed some scholarship guys for that game. The last JV football team at Alabama is filled with interesting stories. 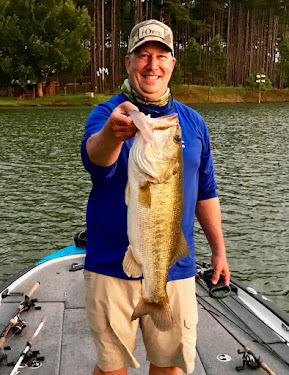 One of may favorites is "Shark deep sure six"- my old Alabama buddies may remember that one. Also Ft Benning's army cheers is another one. My last physical sighting of Coach Bryant was in the concourse of the coliseum during winter workouts. We were running laps (sprints) around the concourse under the stop watch of Al Miller. I remember being sick, running a fever, and sprinting for my life to make those times. Running around the concourse meant dodging water fountains and opening doors. We also slipped on the curves like a bunch of greyhounds on a loose track. Coach Miller said 'go' and we were flying, in panic to make it and then a door flew open and we all almost killed Coach Bryant right there. We all stopped, he laughed, we started again.. finished. And Coach Miller chewed us out for missing the time. "That one, boys, did not count". The team was honorary pall bearers at his funeral. I will never forget that ride to Birmingham in a Greyhound bus behind his hearse. Every inch of Interstate 59 was covered with people, including the overpasses. They stood quietly and held signs. I fought back tears the whole way. 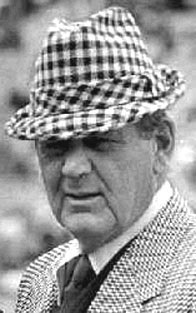 Growing up idolizing Bear Bryant was not a bad thing, it changed my life. Getting to play for him for one season was something I never will forget. Has it been 27 years? Great memories Jay. Thanks for sharing. I remember you as being a very good QB, you just had some competition in Walter Lewis, Ken Coley, Perry Cuda, etc. Thank you Scott- you are a kind friend- but I easily admit to not being in their league!